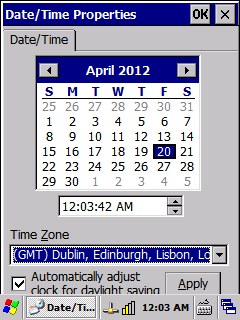 In order to connect with the Kanban Live web site the date and time on the handheld need to be set. Click "Start," then "Settings," then "Control Panel." 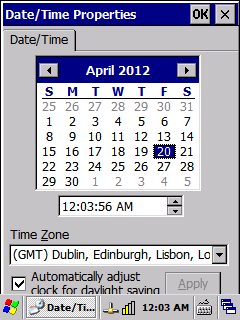 Double-click "Date/Time" to open the time settings. Ensure that the correct date, time and time zone are selected, and that 'Automatically adjust clock for daylight saving' is checked. Tap the Apply button.